Singer Akothee has been doing a lot of crazy things on social media and many people would prefer watching all that from a distance. Zari recently took to social media to applaud the singer’s unique lifestyle and add that she wouldn’t mind enjoying it firsthand at her home. 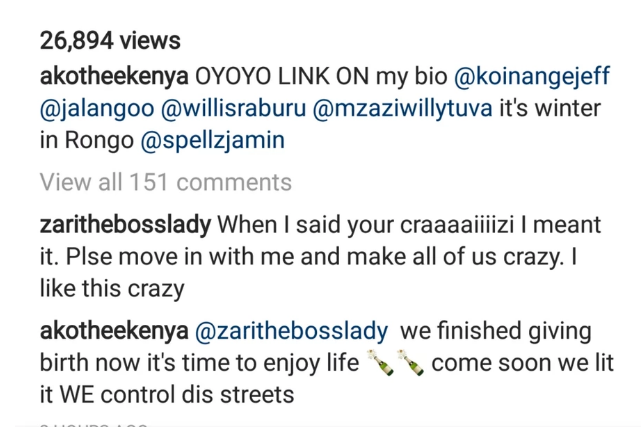 On social media, Zari commented on Akothee’s post saying that she’s one crazy lady but she loves her lifestyle. “When I said you are craiiizi I meant it. Please move in with me and make us all crazy. I like this crazy.” posted Zari. “We finished giving birth and now it’s time to enjoy life. Come soon we lit it. We control dis streets.” she said.